Saturn has successfully installed over 2000 Nurse Call systems from the small individual Care Home to large Nursing Care organisations, specialising within the care industry and recognising the all important need for maintenance and after care. We will provide you with a total package; system design to meet the needs of your home, complete installation and the all important staff training and Nurse Call system certification. Saturn can provide all your Access Control System requirements necessary within your Nursing Home, from the basic keypad door control for exit/entry of the building and restricted areas to the more sophisticated proximity token swipe method and even finger print recognition. Again this can be interfaced with the Nurse Call and Fire Alarm systems providing a total solution package. Saturn can provide comprehensive Staff protection using our Guardian infra-red Staff Attack System. Members of staff are provided with their own belt mounted quick release staff attack pendant which instantly activates the infra-red sensor within the location of activation. The alarm is raised via the fully alphanumeric display units, providing the precise location and identification of the staff member. This facility can be incorporated within the Nurse Call System to ensure the safety of your night staff. Saturn also specializes in providing Addressable Fire Alarm Systems within the caring industry using our extensive in house knowledge and experience within this field. We are main recommended suppliers of the Hochiki range of Fire Alarm smoke detection equipment and the Advanced range of Fire Alarm panels. Our systems are CAD designed to meet L1 standards and we are a fully BAFE accredited Company. Saturn will also provide you with all your Closed Circuit Television System requirements, be it a simple reception monitoring system or cameras watching your car park and grounds. Saturn was first formed way back in 1989, specialising in providing resident's call alarms within the care industry. In these early days during the 'Care Boom' call bell, rest call and alarm bell systems were very simplistic, providing residents call via a push button alarm facility within the bedroom and a pull cord alarm within the bathroom indicating on a call alarm panel. 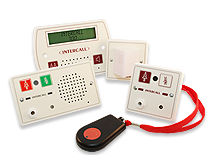 In 1993 Saturn became Limited and partnered with Intercall who revolutionised the nurse alarm system market, producing the legendary Intercall 400 Call, assistance call and emergency call system and Intercall 500 speech system. These then evolved into the Intercall 600 Infra-red and Intercall 700 Speech systems with the cordless remote call alarm pendants and Garden radio nursecall facility, proving to be the most popular and most reliable nurse call systems available. 20 years later and we are still together! Saturn specialise within the care home Business, providing your Nursecall, Profile 18 Specialist Dementia Care technology, PIR Bed Alarms, Pressure bed and floor mats, pressure chair alarm sensors and Disabled Persons Alarms, Fully Addressable Fire Alarm System to L1 standard, Access Control and Door Entry systems to include Keypad systems & proximity readers, CCTV and Staff attack systems, providing a complete 'turn key' solution for your project. Saturn also prides itself with our nursecall after care and call system maintenance packages. You can choose Gold, Silver or Bronze nursecall maintenance to suit your own requirements with full 24 hour call system cover and nursecall servicing at regular intervals. Wearable pendant for garden areas for use with the Garden Call Central Equipment. This pendant is adaptable to your needs. Can be worn on wrist, neck or clipon. Neck pendant for large garden areas for use with the Garden Call Central Equipment. IP470 Call Logging Interface to your Nursing Home's LAN network. Enables any computer using your network to be able to obtan detailed call logging records. Individual bedroom printouts and staff night visit records are easily obtained. A real must for existing Intercall 600 and 700 users! Pear Lead Clip for use on the Intercall NP2, NP4, NP 6 & NP8 call extension lead.